Draining the South Western flank of Volcan Llaima (3125 meters) is the deceivingly innocent Rio Calbuco. After meandering thru braided debris flows coming off the flanks of the volcano, the river tightens up at Puente Calbuco for it’s thundering 8 km descent to the confluence with Rio Quepe below town of Cherquenco. I camped along the upper stretches of this river with my family in December 2004 but it was not until November 2009 that the river was run by a group of Pennsylvania kayakers Emilio Ledonne, Ken Craig, Roger Pyle, Fields Marshall, Keith Schloss and Kurt Casey. To reach the take out go east on paved road S-31 from Temuco to Vilcun then on to Cherquenco. Upon entering Cherquenco turn right upon reaching the plaza and follow the road about 2 km down to steel and concrete bridge over the Quepe River. Continue 200 hundred kilometers and turn left. Go 200 meters and park in the town cemetery, which has access to the Calbuco River (note this point is 100 meters above the confluence with Rio Quepe with an elevation of approximately 500 meters. To reach the put in return to the plaza in Cherquenco and turn right and proceed over the swinging bridge high above the Quepe river (See description for Quepe if this marginally runnable river is of interest) Continue 2 kilometers on this paved road then turn right on the unpaved RUTA INTERLAGOS. Continue 6 km to Puente Calbuco (elevation 640 meters). On the downstream side of the bridge is a gauge. We ran the river on November 20, 2009 with a gauge reading of 1.4. I would guess the flow at the bridge was 400 CFS. The first hundred meters was a bit scratchy but the river quickly turned to bedrock with a continuous, channelized character. Class 3-4 rapids continue for 1-1/2 kilometers where the Estero El Tigre cascades in from the left and bumps up the flow another 200 CFS. 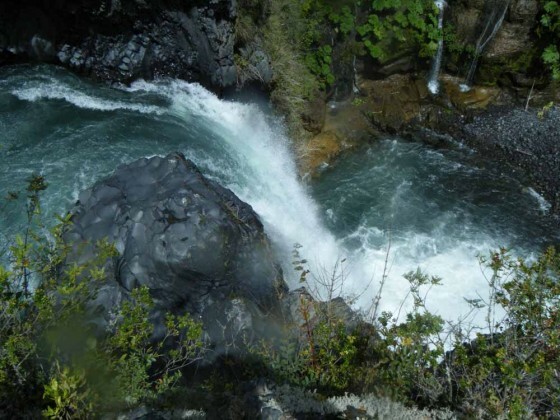 The whitewater is continuous and reasonable for next 600 meters but then quickly enters a class 5+ slot canyon that culminates in an awe inspiring 30 meters falls. Do not blunder blindly into this canyon as there is no eddy before the big falls. The portage around the falls is an adventure in itself. After great views from the top a fisherman’s trail needs to be located several hundred meters downstream to reach the base. Cliffs and dense foliage make locating the trail a formidable task. Multiple logging trails criss-cross the forest making for a very confusing journey. To our surprise we found the Interlagos road while trying to find the trail down to the river and realized it is possible to visit the falls without a kayak. If you driver from Cherquenco and turn onto the Ruta Inerlagos road (same as for put-in), proceed 3.8 KM then park car and climb through a fence on the right. Walk several hundred meters into the forest and you will eventually reach the cliffs above the river. Follow the cliffs upstream until you reach the falls. Overall this class 3-4 stretch drops 140 meters in 8 km. 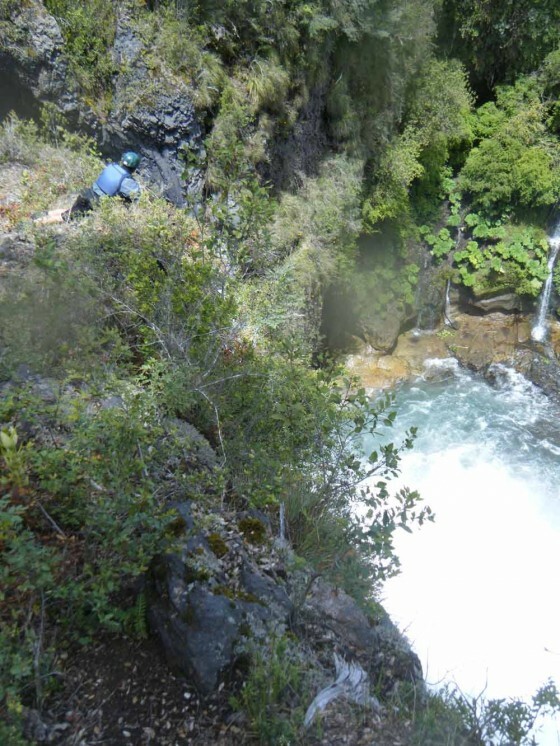 40 of those meters are lost within the 1 km stretch of the falls, and the remaining 100 meters of gradient is consistently spaced out over 7 km of river making for an average gradient of 15 m/km or 75 FPM (excluding the falls). 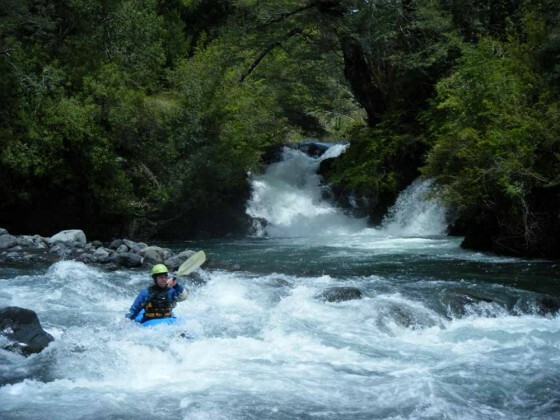 The river is best run in the high water spring runoff or after prolonged periods of heavy rain. Other nearby rivers: Quepe, Truful Truful, Alpehue, Queupude, Captren, Blanco del Sur, Cautín.